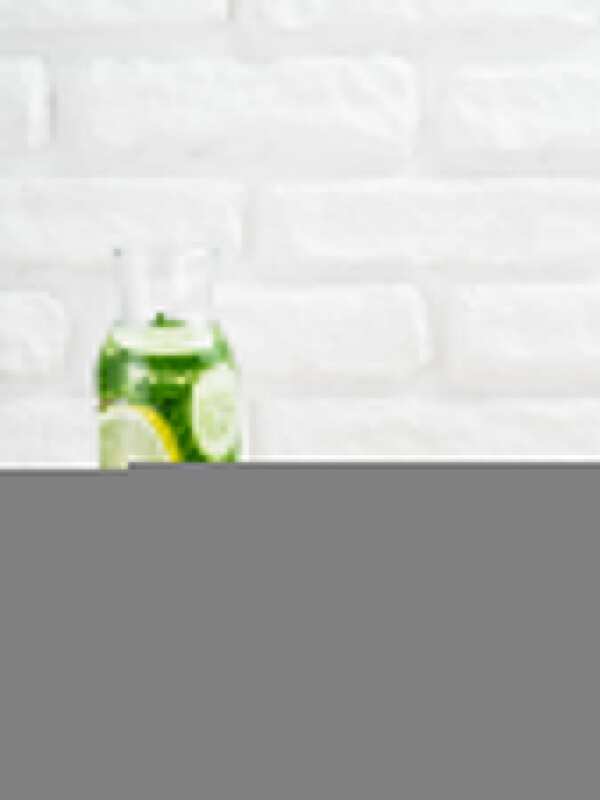 Inside: These 6 detox water ingredients will have you well on your way to beautiful and glowing skin. Plus, the flavor they add to your water is amazing! Half the time, I don’t even think about the taste of water. I just drink it because, well, I have to. However, when I do find myself getting tired of plain water, I turn to fruits, veggies, and herbs to spice it up a bit. The possibilities are endless and can provide an array of health benefits, especially for skin. 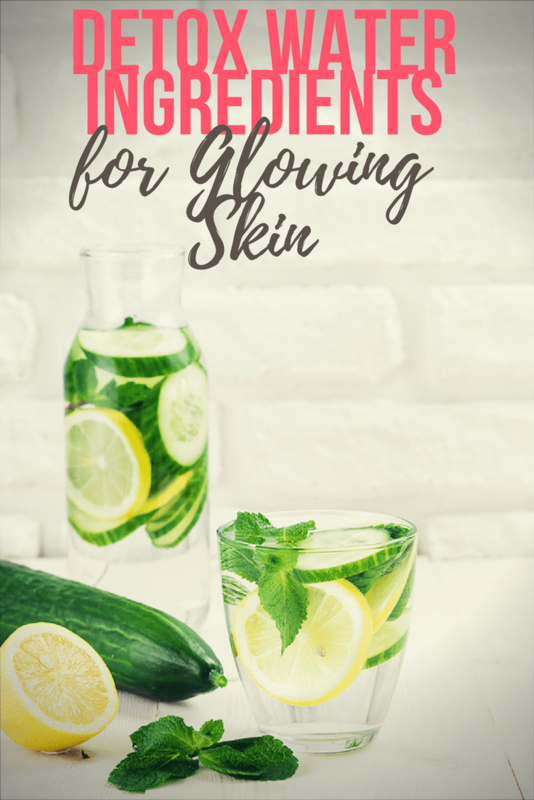 Today, I have 6 must-have detox water ingredients that are sure to give your skin a gorgeous glow. Lemons have been served with water at restaurants for years, and for good reason. Adding a couple lemon slices to your daily water is one of the best ways to keep your skin healthy. Lemons are Vitamin C and collagen-rich, two important ingredients for great skin. Try waking up every morning and drinking some warm lemon water. You’ll see some pretty significant benefits, starting with your skin. 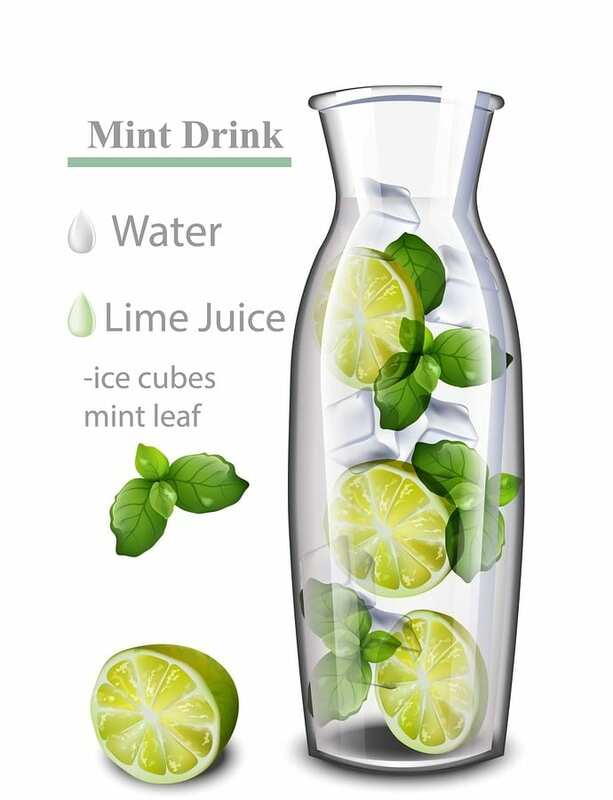 Mint’s purpose in water is primarily to detox your digestive system, but surprisingly, your digestive system is connected to your skin. If your digestive system isn’t the healthiest, other organs (aka the skin) have to help out, leaving them looking tired and worn. So when you’re taking care of your digestive system, you’re also taking care of your skin! Add a few mint sprigs on top of your lemon for glowing skin. You can also add some fresh strawberries for a refreshing twist. Basil is actually an excellent anti-inflammatory, a must for your skin. It keeps blemishes and wrinkles at bay, while also protecting your skin from external damage. Basil is also a wonderful antibacterial agent and is stocked with antioxidants. So basically, nothing could be better for your skin. Just pluck a few leaves from your basil plant (or buy it in the produce section of your local grocery store) and you’re good to go. Add some cherries for a delicious flavor and added health benefits, or add oranges for a tropical taste. Ginger has saved me on many occasions, especially when I’m sick. Ginger is best known for its anti-inflammatory properties and is often used in tea to combat sore throats. The anti-inflammatory properties also go for the skin. Like basil, ginger also helps keep blemishes and wrinkles away. Plus: it’s antibacterial on top of being anti-inflammatory. If the taste of ginger is not your cup of tea, add strawberries and lemons to mask the flavor and add a lemonade-like flavor. Kiwis contain antioxidants, vitamins, all the good stuff you need for healthy skin. BUT they also contain zinc, which is wonderful for maintaining healthy teeth and nails, as well as skin. Hitting two, no, THREE birds with one stone. Fun fact: a kiwi actually has more vitamin C than an orange! Cucumber water has been a spa day staple for forever, but there are plenty of reasons to drink it away from the spa. Cucumbers do an excellent job of flushing the toxins out of the body, while also keeping you super hydrated. Like several of the foods here, it provides anti-oxidants, vitamin C, and best of all, vitamin B-5. B-5 is essential for healthy skin, as it helps keep your complexion healthy and has been used in the treatment of acne. I highly recommend giving cucumber detox water a try. Making detox water is incredibly easy. The easiest way is to use what you already have. Grab a pitcher and put your detox water ingredients in. Add ice and then fill with water. Let it steep in the refrigerator overnight. Then wake up to yummy tasting water you can sip on throughout the day. You can refill the container using the same ingredients 2 to 3 times before you’ll have to change them out. 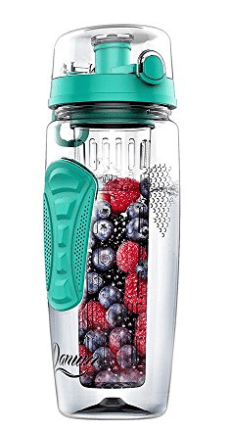 Another way to make detox water, which is perfect if you’re on the go and can’t take a large pitcher with you, is to use a fruit infuser bottle. 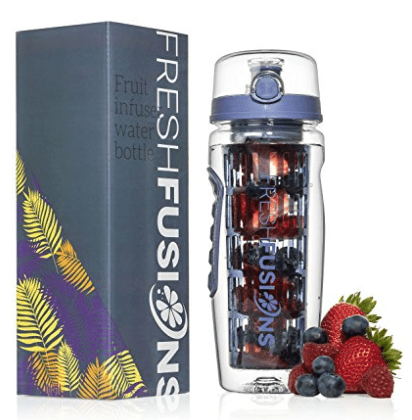 Fruit infuser water bottles have a separate sleeve on the inside of the bottle that you fill with your detox water ingredients. Just add your ingredients, fill up the bottle with water and give it a bit for the ingredients to steep. You can refill the bottles several times before you need to replace the ingredients. 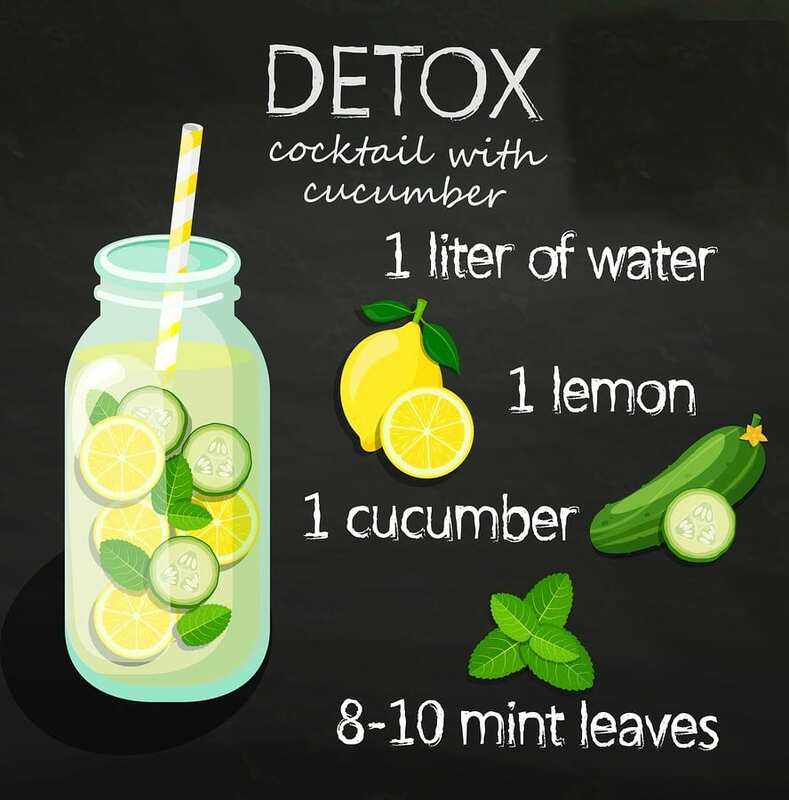 Have you tried any of these detox water ingredients before? If so, what’s your favorite? The detox water bottles look so cute! I love detox water, it always helps me feel lighter and debloat after a day of unhealthy eating. Especially with lemon and mint! 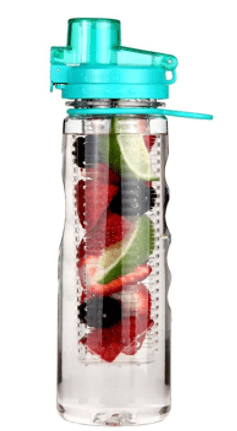 I love making infused water! Lemon and cucumber is a must in my home. Can’t wait to try ginger, thanks for the tip! It’s so good! Especially ice cold in the summer.